If your desk is anything like mine, having a designated spot to store all of my various Apple bits and bobs is invaluable. 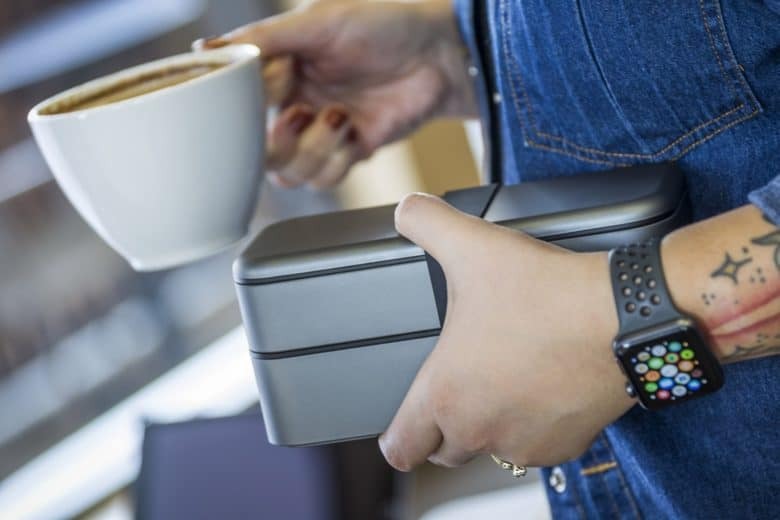 BentoStack’s ultra-compact design eliminates clutter on the work space by keeping essentials neat and organized, yet within hand’s reach. No more messy desk sprawl! Carry all your essentials with ease. 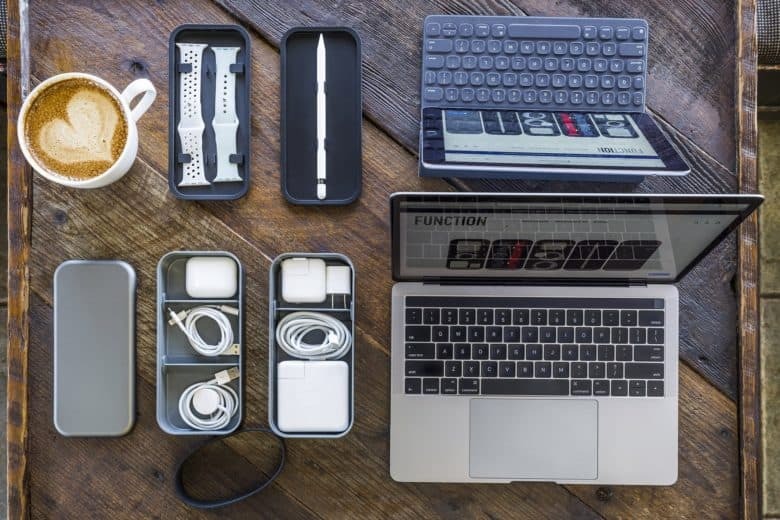 The BentoStack is comprised of multiple compartments organized via four separate trays and individualized boxes designed to hold over 10 Apple essentials. It has adjustable dividers so I can create custom storage compartments designed to hold what I need it to hold. I love the flexibility that customization brings to this great accessory. The design is beautiful and minimalist with rounded corners and a smooth finish. It’s visually appealing as well as completely functional on my desk or in my hand on the go. Wiplabs provides two silicone straps to secure BentoStack. The bottom storage compartment houses larger accessories like adapters, while the upper section holds smaller items such as charging cables or Airpods. 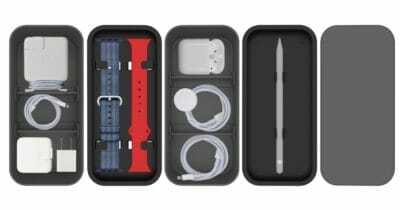 The bottom lid holds two extra Apple Watch bands and the top lid holds the Apple Pencil. 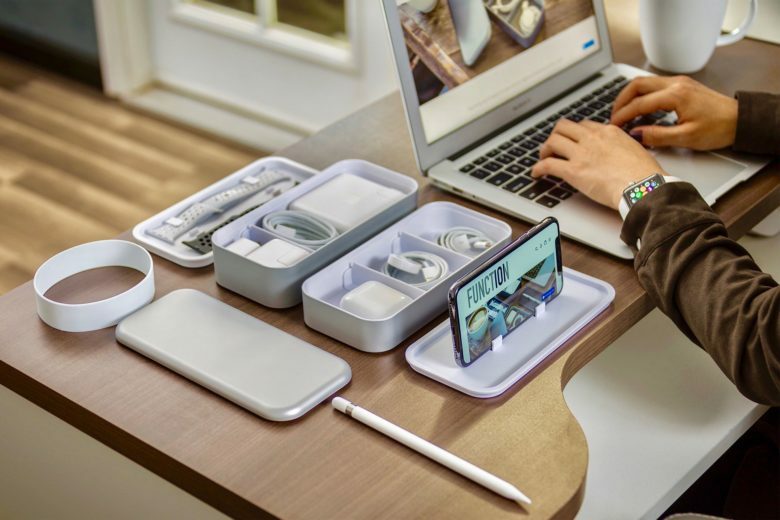 BentoStack by Wiplabs keeps all your Apple essentials organized, both on the road and on your desk. Shown above in Silver. Wiplabs is a “Work in Progress Lab,” where the company locates and provides the best crowdfunded products with innovative designs. They scour Kickstarter, Indiegogo and other crowdfunding sites, and select the best products to showcase. Clever design and beauty are two of the most important benchmarks in Wiplabs’ product selection. Wiplabs products, including the innovative BentoStack, are unique in that they have already passed the scrutiny of a mass of people. All of Wiplabs products are customer-vetted and thoroughly tested before even being acquired. Fashioned after Japanese Bento boxes, BentoStack efficiently holds over 10 Apple essentials in the palm of your hand! Shown above in Space Grey. The BentoStack is available in Silver, Space Grey or Rose Gold (sold out). Comes with two silicone straps to hold all of your Apple gear in place. These will sell out, so order while supplies last.